The dreaded night, the first full moon of the new year, has finally arrived. Will Taylor survive when evil threatens to destroy her life forever? Taylor relocates back to Big Bear Lake not trusting the people who signed a treaty to keep her safe. Being with her family and friends is wonderful, but knowing that she is a sacrifice is beyond unsettling. Tired of everyone trying to control her fate, Taylor fights to gain control. Tabby and her friends hunt for a way to stop the impending ceremony. At the same time, they dig for clues into the mauling of tourists. Relations are on shaky grounds between the witches, werewolves, and vampires, and Taylor tries to keep a war from breaking out. 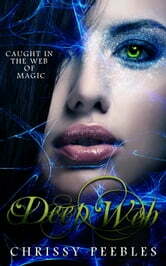 When secrets are exposed and traitorous alliances are revealed, Taylor is thrown into a deep web.